I’m on day six of no-wheat and I’m feeling murky and strange – so what better day to talk about something as simple as the bandana! There is nothing I love to have in my camping arsenal more than a good, triangular bandana. Tied around the neck for easy access, the bandanna can be used as a napkin, a sweat-mop, a bandage, a face cloth, a head-covering against the sun, a dish cloth or drying towel, not to mention toilet paper in desperate times. Particularly appropriate is the How to Build a Campfire fabric discovered at Spool of Thread when I went in to get some otherwise-boring white fabric for quilting with a few weeks ago. It really does illustrate the building of a good campfire so if you’re out in the woods and forget…. you get the idea. 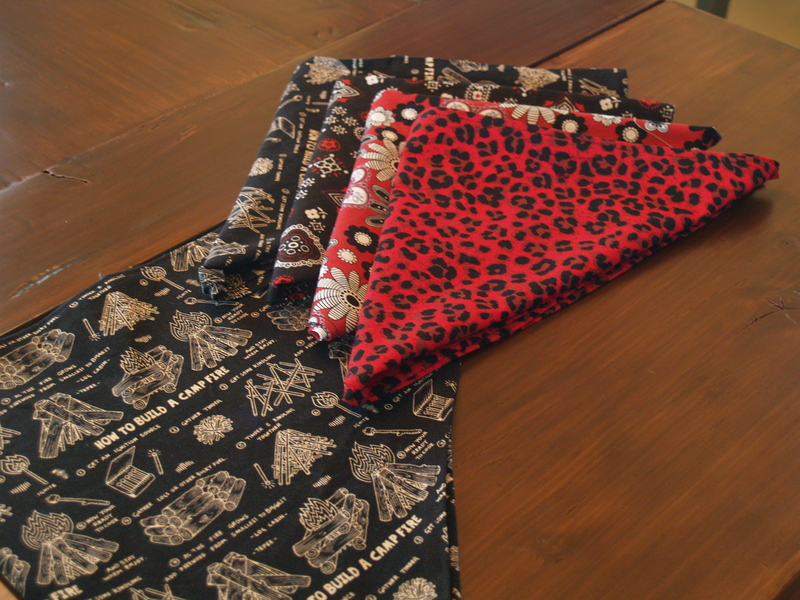 Looking forward to rocking these neck-kerchiefs on a trail sometime soon! That would be sometime after I write my term paper that is due in two weeks. And sometime before I get started on my bathing suit project (please vote on my fabric choice in yesterday’s post if you haven’t already). Summer! I’m ready for you! (Almost). ← Design notebook: A swimwear poll.